Arseny Mikhailovich Avraamov was an avant-garde Russian composer and theorist. He studied at the music school of the Moscow Philharmonic Society and when the first would war broke out he refused to join the army and fled the country working, among other things, as a circus artist. Avraamov returned during the revolution of 1917 where he pioneered optical synthesis techniques and developed his own “Ultrachromatic” 48-tone micro tonal system ( “The Universal System of Tones,” 1927) but is probably best know for his “Simfoniya gudkov” or ‘symphony of sirens’ (November 7, 1922, Baku USSR) which involved navy ship sirens and whistles, bus and car horns, factory sirens, cannons, the foghorns of the entire Soviet flotilla of the Caspian Sea, artillery guns, machine guns, seaplanes, a specially designed “whistle main,” and renderings of Internationale and Marseillaise by a mass band and choir. “By knowing the way to record the most complex sound textures by means of a phonograph, after analysis of the curve structure of the sound groove, directing the needle of the resonating membrane, one can create synthetically any, even most fantastic sound by making a groove with a proper structure of shape and depth”. From ‘Upcoming Science of Music and the New Era in the History of Music’ by Avraamov, 1916. “Composer Arseny Avraamov at the scientific-research institute conducts the interesting experiments on a creation of the hand-drawn music. Instead of common sound recording on film by means of microphone and photocell, he simply draws on paper geometrical figures, then photographing them on sound track of the filmstrip. Afterwards this filmstrip is played as a common movie by means of film projector. Being read by photocell, amplified and monitored by loudspeaker, this filmstrip turns out to contain a well-known musical recording, while its timbre is impossible to relate to any existing musical instrument. Multzvuk group was formed in 1930 by Arseney Araazamov to conduct research into graphical sound techniques. 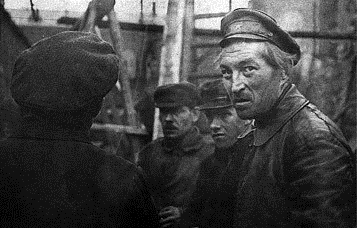 The group was based at the Mosfilm Productions Company in Moscow (one of the leading film production companies in Moscow, renamed Gorki Film Studio in 1948) and consisted of composer and theoretician, Arseney Araamov, cameraman and draughtsmen Nikolai Zhelynsky, animator Nikolai Voinov, painter and amateur acoustician Boris Yankovsky. In 1931 the group moved to ‘NIKFI’, the Scientific Research Institute for Photography for Film. Moscow, and and was renamed the ‘Syntonfilm laboratory’. In 1932 NIKFI stopped funding the group who then moved to Mezhrabpomfilm and finally closed in 1934. From 1930-34 more than 2000 meters of sound track were produced by the Multzvuk group, including the experimental films ‘Ornamental Animation’, ‘Marusia Otravilas’, ‘Chinese Tune’, ‘Organ Chords’, ‘Untertonikum, Prelude’, ‘Piruet’, ‘Staccato Studies’, ‘Dancing Etude’ and ‘Flute Study’. The Multzvuk archive was kept for many years at Avraamov’s apartment, but destroyed in 1937. ‘Marusia Otravilas’ mentioned in the last paragraph, the original seems to be ‘Маруся отравилась’ (Poisoned Marusia)? does it really end with Chowning?